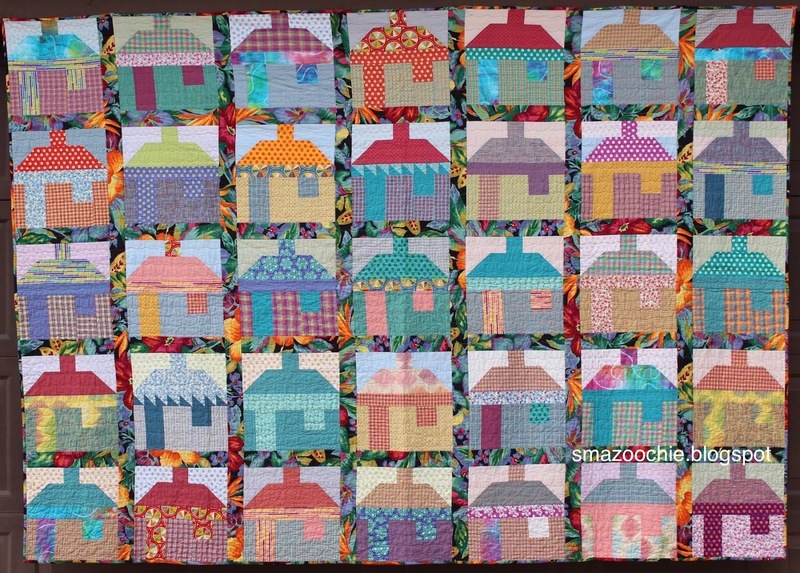 I made this quilt as a house warming gift for a friend at work. His house, the one he & his wife built in the 1980s was severely damaged by flooding after Hurricane Harvey. He has been a widower for about 10 years & is getting on in age. 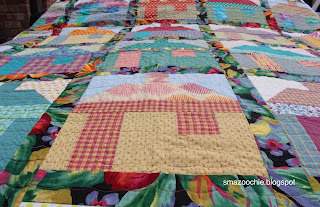 He was faced with the prospect of repairing the house or starting anew, he finally made the difficult decision to leave the old house & get an undamaged one. He has been in the new house for a few months now, but is only now nearly done with sifting through 30 years of life in a house. It has been a hard & draining process for him, so I wanted to make him something special. 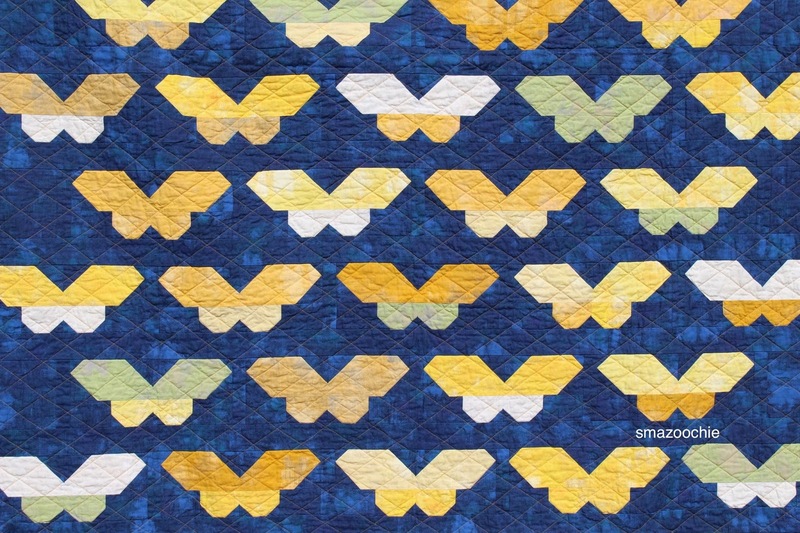 At work, his area is the entomology collection & his special love is butterflies & moths. 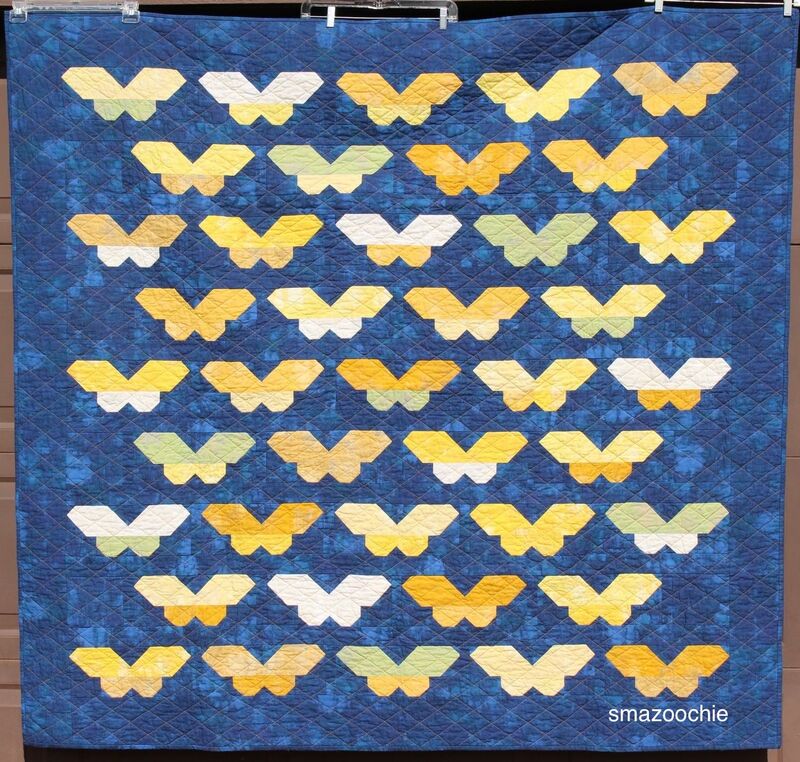 So I wanted to make him a butterfly quilt -- but a butterfly quilt that isn't girly. Keeping the colors simple seemed keep it masculine, yellow & blue seemed a good choice. 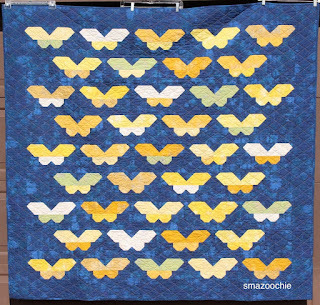 There are sweet little yellow butterflies called Sulphurs that I thought would be perfect. 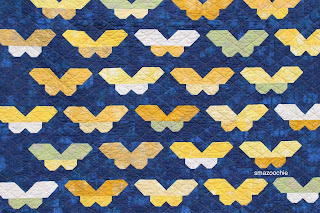 I tried drafting a Sulphur-shaped block but it looked kind of clunky, so I decided to use Elizabeth Hartman's Ghost Moth pattern. This was a 2017 finish. A few years ago, I went with Shug to San Antonio. There was a gathering of wood-turners (yes, turners have 'guilds', retreats & big gatherings just like quilters) that he wanted to attend. Neither of us had ever been to San Antonio& the meeting was to be on the River Walk -- so, Yeah!, let's go! Not to be sexist, but most wood-turners are men, and most of their spouses are women. In advance of the meeting, there was a call to see if any of the spouses would be interested in a quilting lounge or maybe a shop hop. The shop hop sounded fun, I had never been on one, so one day of the wood-turners' meeting, a bunch of us piled into a bus & hit the road. We went to 4 shops in the greater San Antonio area. 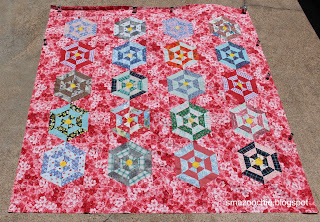 Of course, I needed nothing, but I ended up with a lot of floral fat quarters -- they were speaking to me that day & I could see them all together in something very cheery. 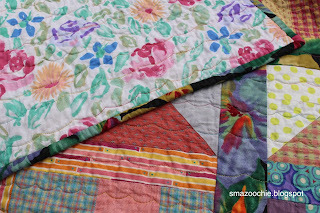 A couple of years ago, I began seeing this cute quilt & knew I found a perfect setting for my florals. 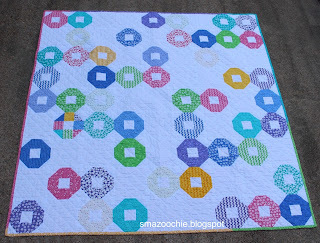 But, my go-with was a roll of ombre solids, so I could not exactly follow the pattern. 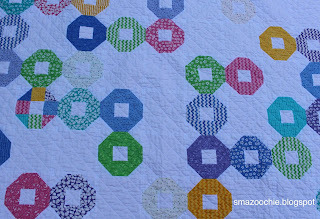 I modified it to use 2.5 inch strips & quickly sewed up this very cheery quilt. 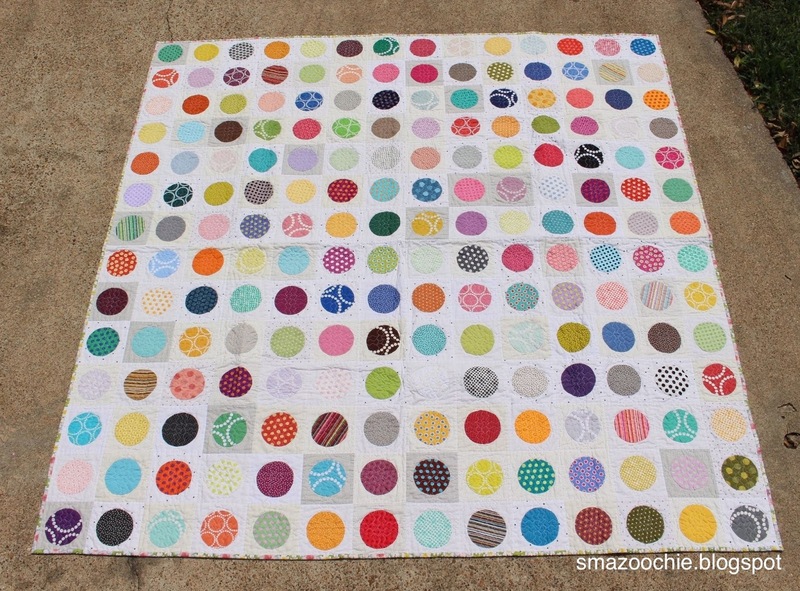 I love making baby quilts & take any opportunity to make one. Your neighbor's second cousin is expecting? 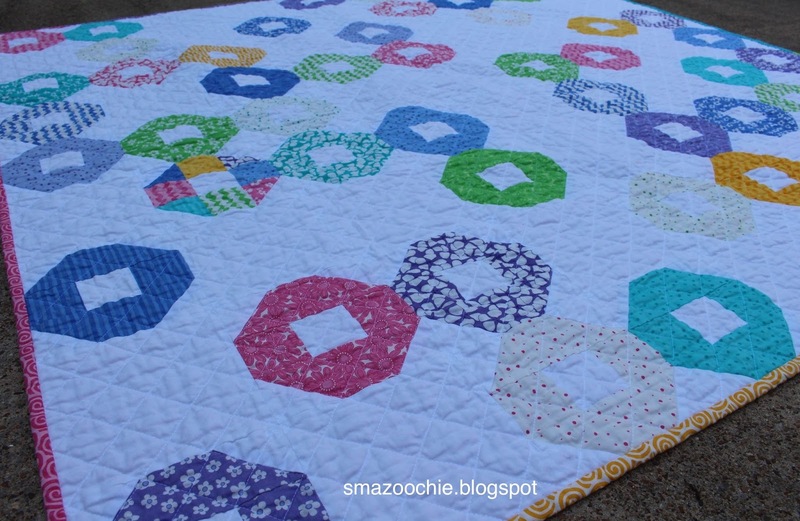 Does she want a quilt!?! My recent opportunity was not quite so oblique. The woman who does my hair. She's very sweet, has a 10 year old son & is awaiting a daughter at the end of October. A quilt is in order! This was made entirely with materials on hand -- both pleasing & slightly embarrassing to me. 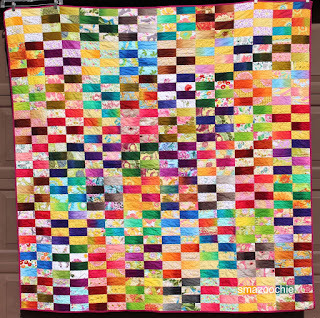 Anyway, the quilt, Hugs, along with a baseball pillow case for the big brother, has been given to the growing family & they were quite pleased with both. Del Mar is finished, but rather than folding it away to use on the bed in the coming winter, I put a sleeve & label on it & packed it up to ship -- because it was accepted into the Made in Texas exhibit at the Texas Quilt Museum. 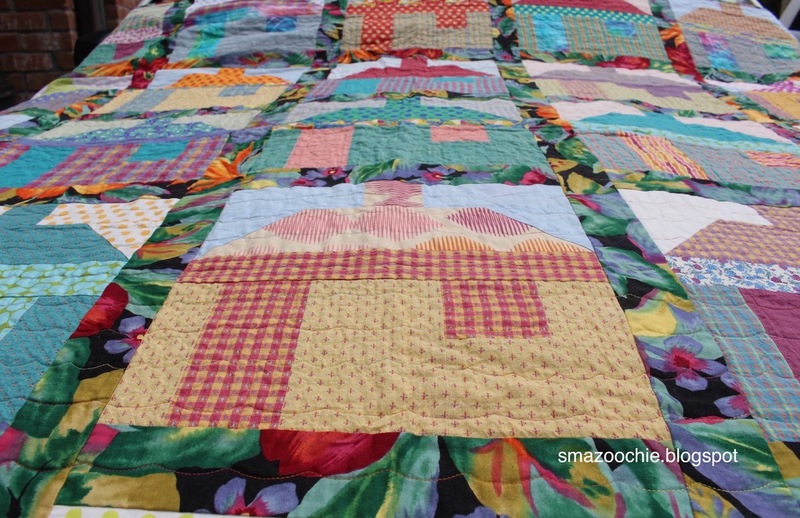 I handed the quilt over to FedEx on Friday morning 25 August -- that night hurricane Harvey hit the Texas coast between Corpus Christi & Houston. Over the next week we got nearly 46 inches of rain, but unlike so many unfortunate Houstonians, we did not have water in our house. I won't go into the drama of the week, except to say that it was rough watching the horror unfold on television. Again, Shug & I were safe & dry, but it was hard to see our city struggle. My quilt, Del Mar, inspired by houses on the Texas Gulf Coast, sat somewhere in the care of FedEx. I was not really worried about its whereabouts, just wondered if it might be sitting in muddy water somewhere. Then I thought, if it was in muddy water, I would just wash it as best I could & the quilt would tell a slightly different story about life on the Gulf Coast. But it arrived safe & dry in La Grange (which had its own bad experience with Harvey). A friend I know through work is facing an uncertain future. Less than 2 years ago, he was diagnosed with a degenerative lung disease. At the time, he was symptom-less, but it was not long before he had a 24 hours/day CPAP machine & restricted activity. Now he is in the hospital on high levels of oxygen & is on the short list for a double lung transplant -- waiting, waiting. Well, there is not much I can do except make a quilt to show that I am thinking of him. 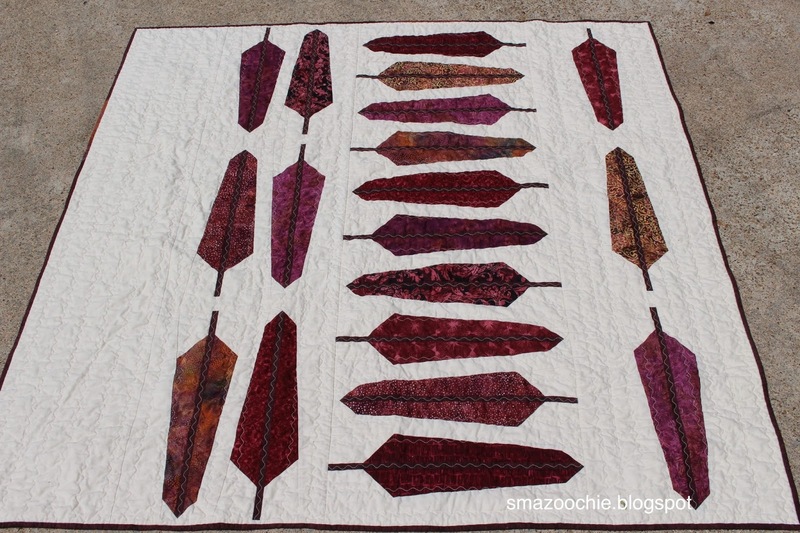 So, with Anna Maria Horner's feather pattern, I made a quilt that I hope has healing powers. Last year, when I was planning a quilt for my oldest niece's Big Birthday, time was passing & I still hadn't decided on a pattern -- I needed to start *something* or I risked running out of time! 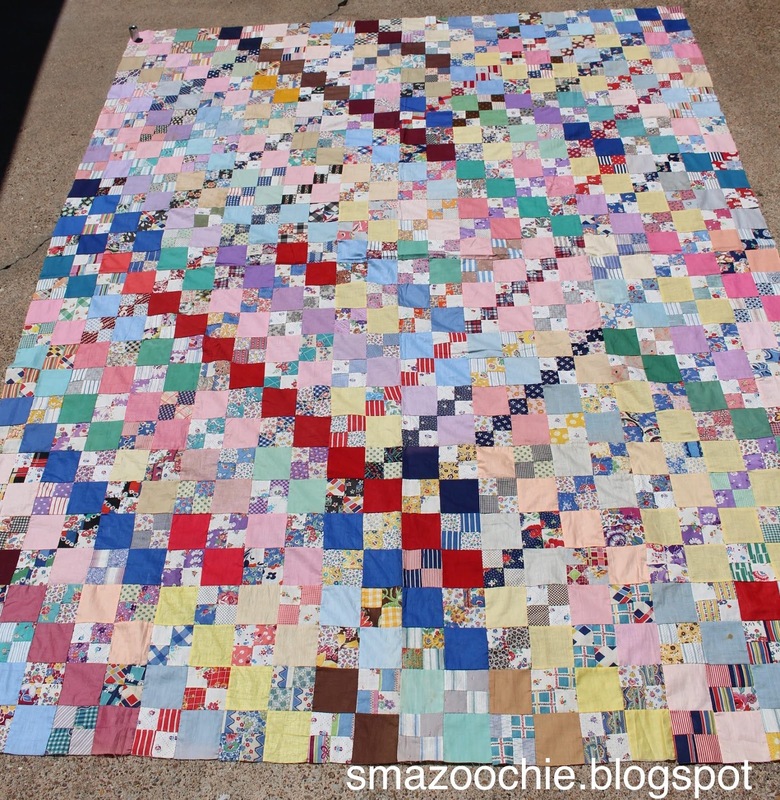 So I began 2 quilts. I quickly knew which was hers & had a second that would be a gift for someone else. The second one got moved to the back burner. 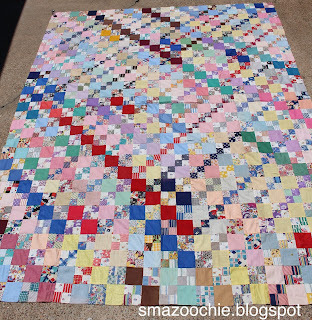 I pulled it out earlier this year, quickly finished the piecing, then put in about a 40 hours of quilting! 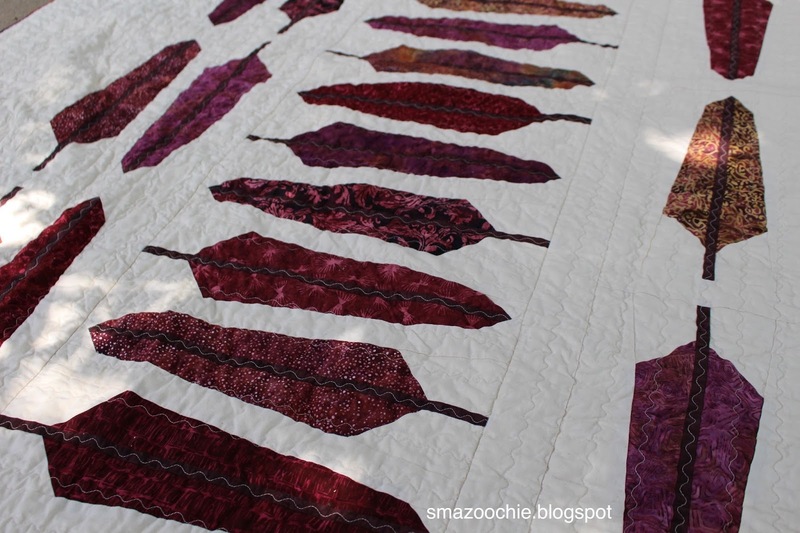 It was not until I was editing my images for this post that I noticed my mistakes. They are not glaring, you may have trouble finding them & I don't think the new owner will mind. 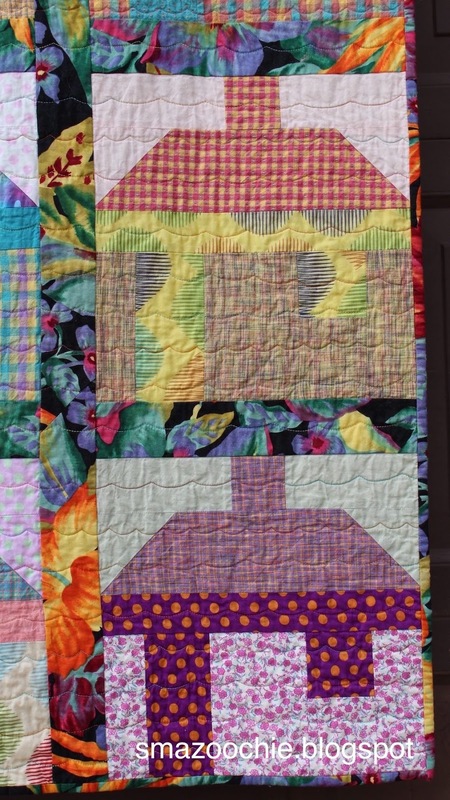 I began these blocks in January or February of 2016. Audrey at Quilty Folk was hosting a quilt-along: Quilty 365. 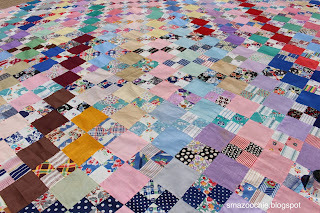 I didn't manage 365 blocks, just 196. I finished it this year just about the time our brief Gulf Coast winter ended. Oh well. 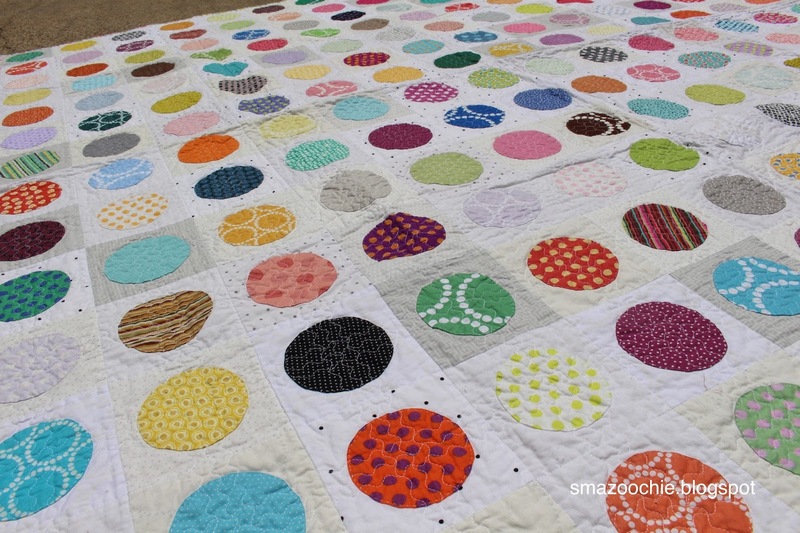 It is still very jolly, all dots with a few checks & stripes. I am calling it Pompoms. 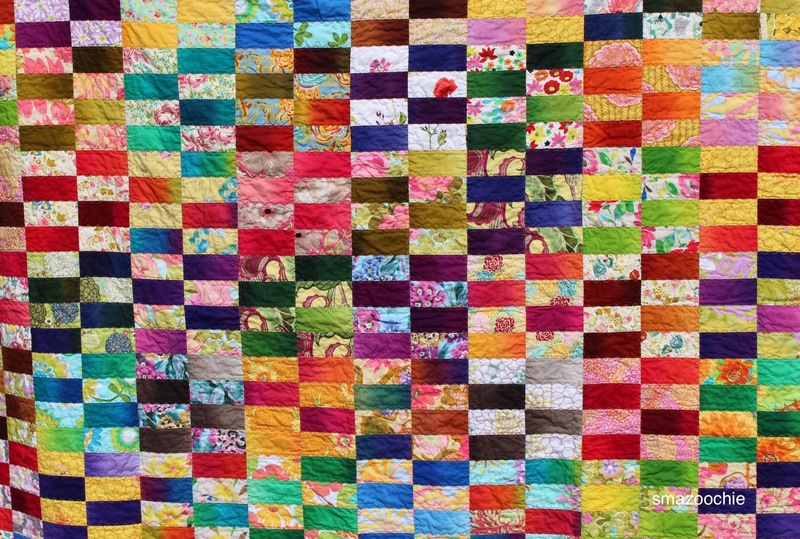 I've made quite a few milestone birthday quilts in the last several years. Oddly, as a milestone of my own was approaching, it did not occur to me to make myself a quilt. Eventually, though, the seed planted itself in my head & the idea flourished. 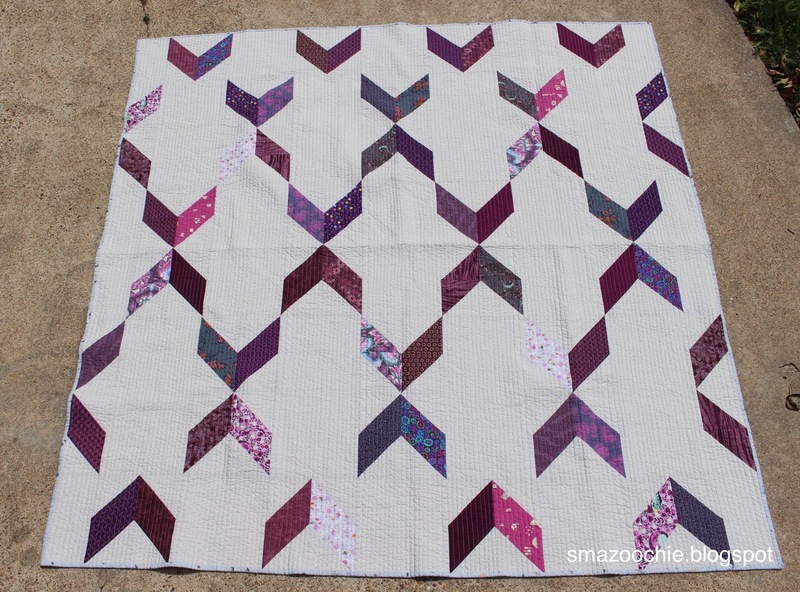 I am now making myself a milestone birthday quilt! It will be an on-going project. 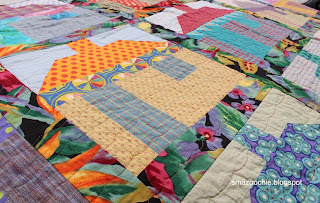 My quilt is a mash-up of 2 quilts in Mary Elizabeth Kinch & Biz Storms' book Small Pieces, Spectacular Quilts. 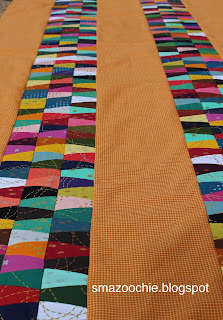 My wedges are from a stack of metallic prints on solids that I got at Quilt Festival a few of years ago, the whole-cloth bands are a pumpkin-colored mini plaid. 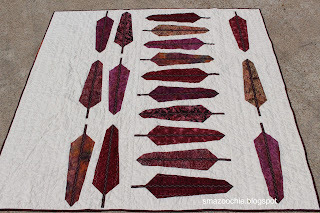 I am surprised at how quickly they sew together -- I sit down with my pile of wedges, sew 2 together, another 2 together, then those 4 together -- next thing I know, I have a long string of wedges. The 3rd one is done now & I'm ready to begin the 4th. 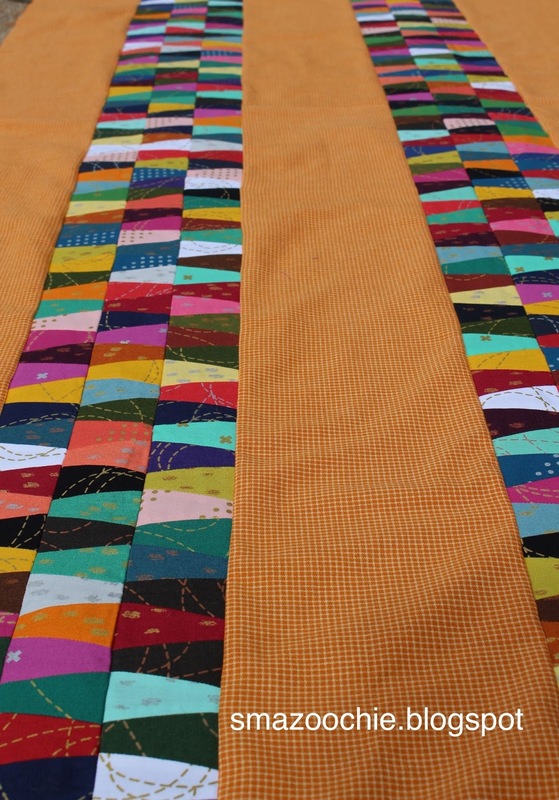 I calculate that I will need 8 pieced bands -- so I'm nearly half-way there! My brother's wife died Christmas morning -- unexpectedly, quickly & much too soon. She & I were alike in some ways -- both stubborn, opinionated & bossy -- but very different in other ways. She was boisterous, spontaneous, gregarious; she lived life turned up to 11. Me? I rarely turn it up to 6. Over the years, because of our similarities & our differences, she sometimes made me pretty mad (I'm sure I made her mad as well), but I always loved her because she was lovable. I hope she always loved me. The 2 days she was in the hospital, being 800 miles away, all I could do was keep my phone close, worry, weep & regret that I was not near enough to help support my brother & say good-bye to my sister-in-law. 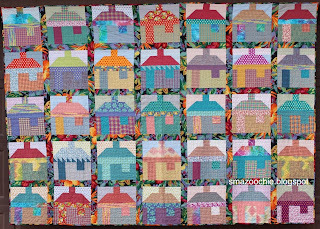 To keep my mind & hands occupied, I sewed. I picked up a couple of projects at hand & sewed & sewed & sewed. 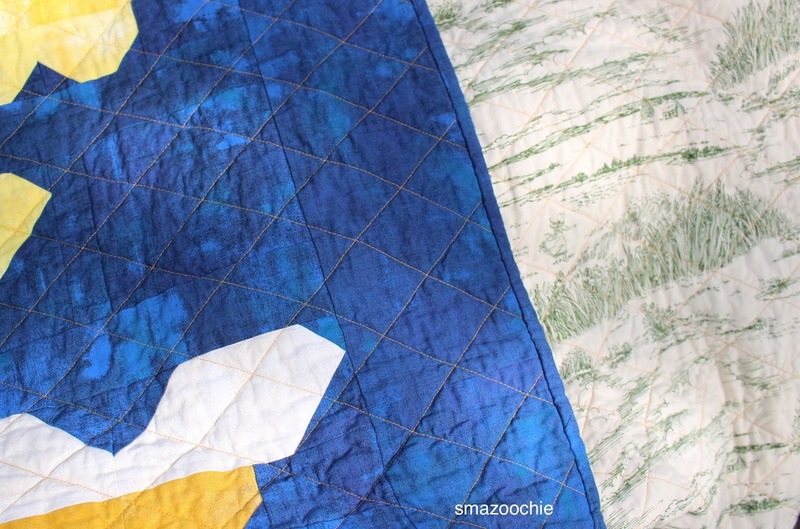 I sewed until I was exhausted. I began the cake stand blocks late last year. I quickly set them together that weekend. 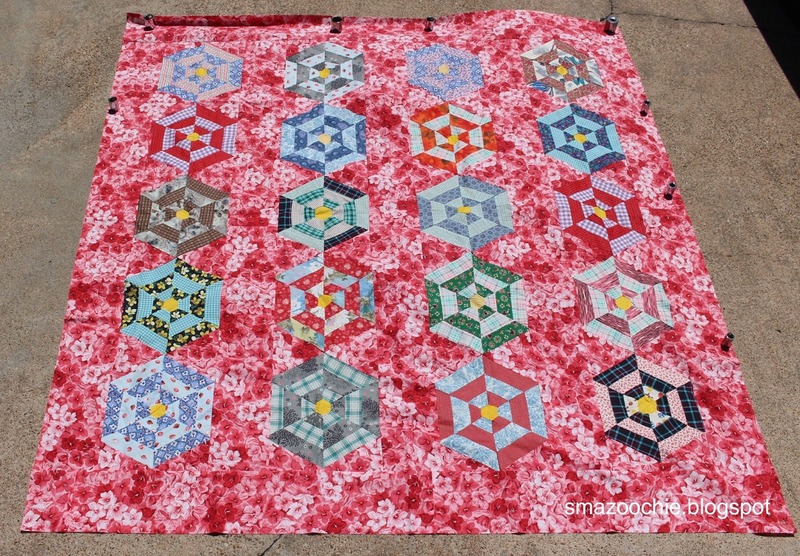 The other project I worked on was one using parts from a scrappy little top-let that I got at Quilt Festival -- an irregularly-shaped thing of 22 6-sided wheels made with 50s era fabrics. I had taken the wheels apart, but then what? 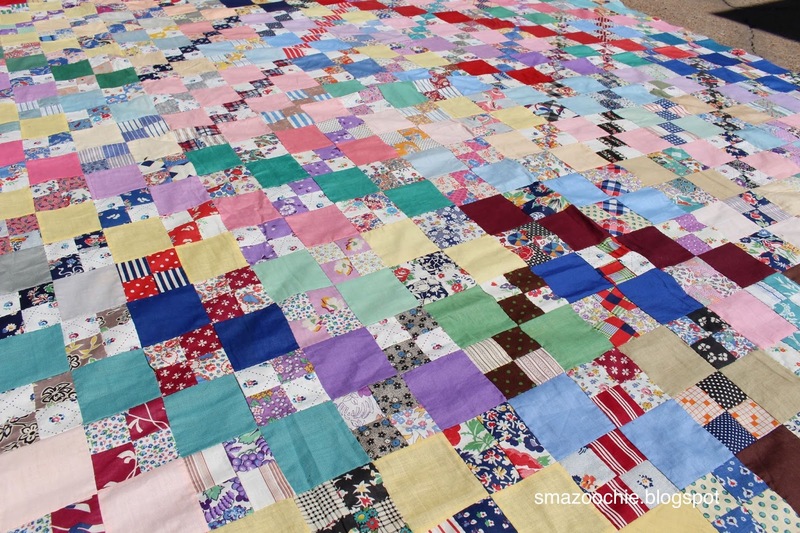 How do I make a quilt from 22 wheels? 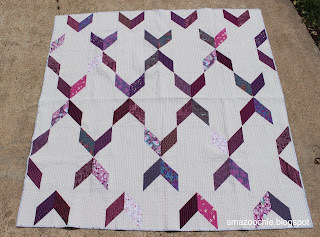 I had decided on how I would set them together & had cut some muslin triangles to fill in the gaps. 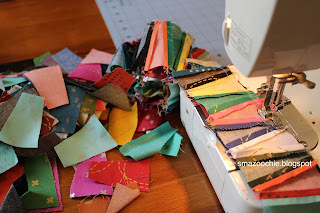 I was sewing triangles to wheels, when I nearly literally gave myself a shake. "Why are you being so cautious!?! 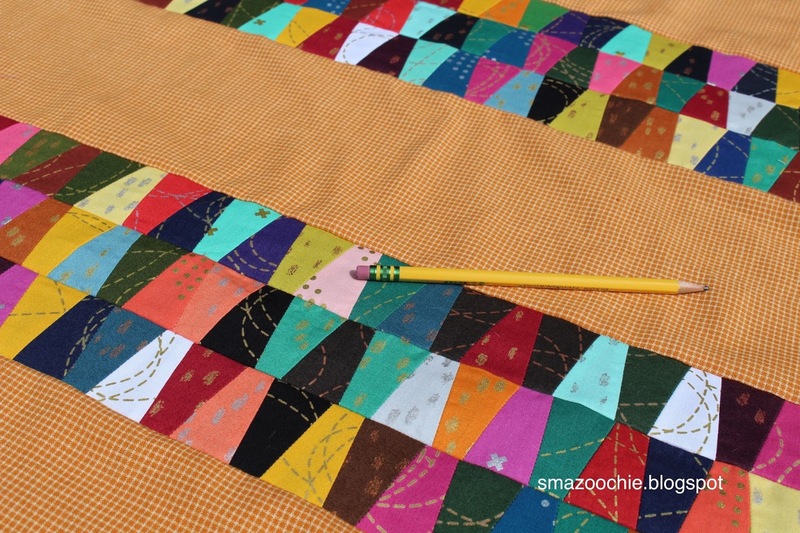 It's only fabric! It's only color! LET GO!! Turn it UP!!!" So I pulled out a vintage floral & pinned the wheels to it. They seems to float about the flowers. 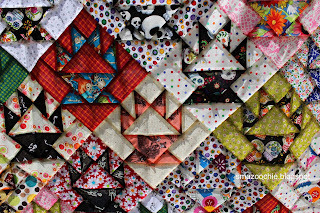 Without much thinking, I cut triangles & strips & sewed it all together. 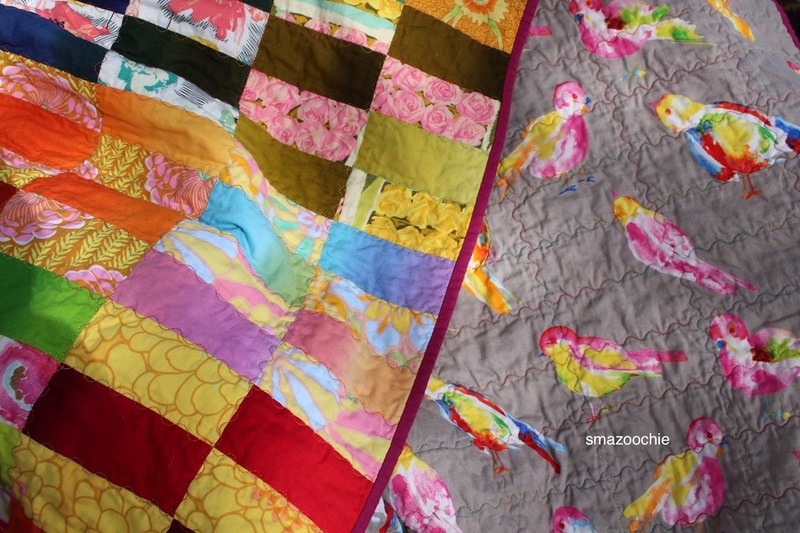 Neither is finished, but each was a lesson in spontaneous sewing using my new motto: What would Jennifer do? I see a newly listed item I like. I bid the seller's minimum, put in my maximum & wait. In the next few days, I am the only bidder. I start congratulating myself for being a smart eBay buyer -- not only will get this thing, but I will get it for a bargain price! A few more days & I am still the only bidder. I convince myself that I am the only person who wants this thing. I also convince myself that I want this thing more than anything in the world. At the last minute -- & I mean The. Very. Last. Minute. -- someone sweeps in & out-bids me. *My* beloved treasure will be going to live with someone else. I am heartbroken. So, as a rule, I stay away from eBay. 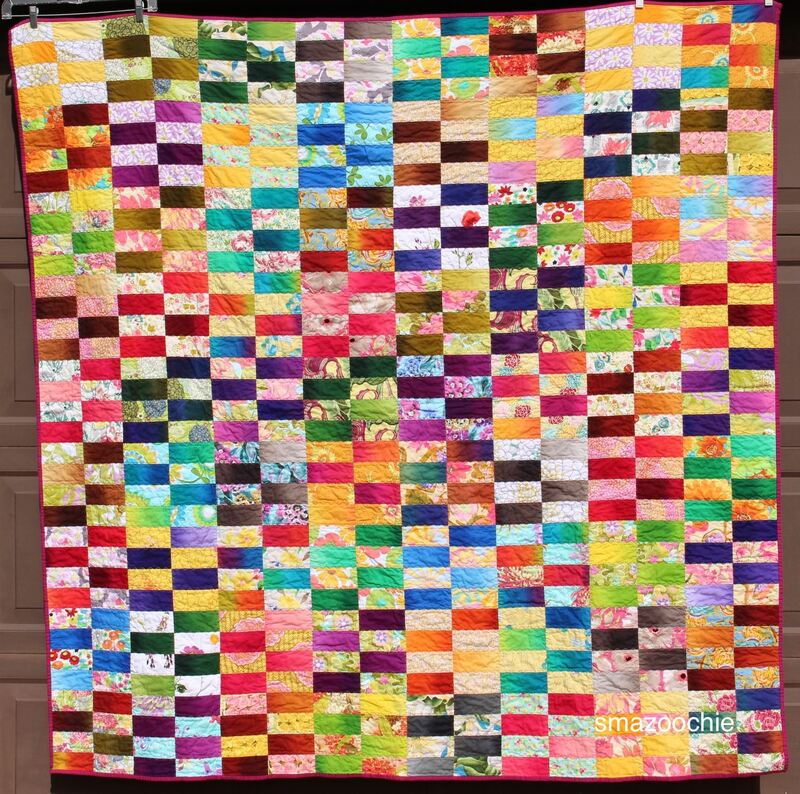 But sometimes I need to look at quilts & eBay is a good place to see a wide spectrum of quilts. Recently, I was scrolling through the listings & came across one that really grabbed me: a simple double 4-patch top set with a variety of solids. It was nearing the end of its auction period & no one had bid on it. So I did, but with little expectations. In the remaining days, no one else did bid, so I actually won it! A few days later, it arrived in the mail. I am delighted! It is so charming! I would guess it to have been made in the late 20s to early 30s. Such a variety of prints, plaids, stripes & solids! As usual, I wish it could tell me its story. In those days when money was so tight, why didn't the maker finish it? Some of the tiny 4-patch squares are pieced! 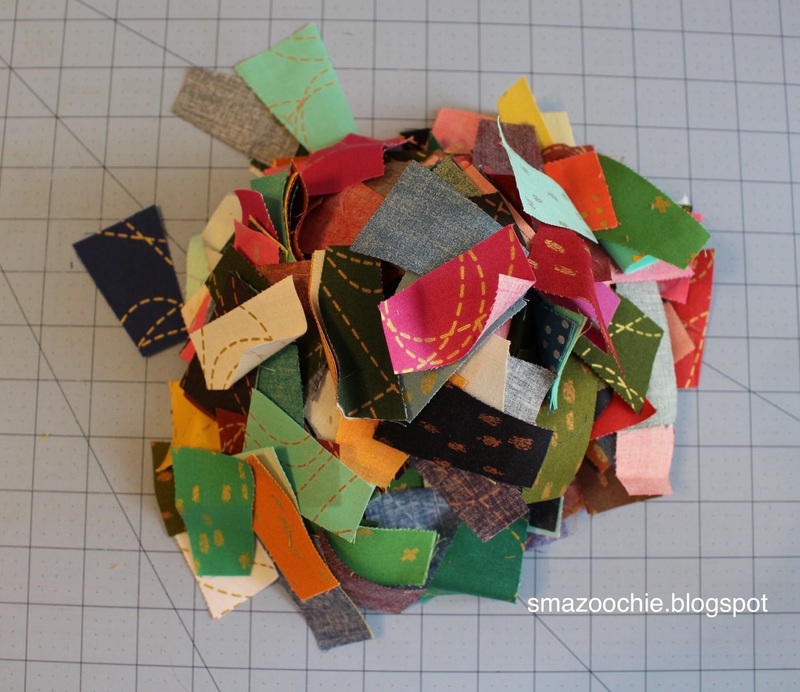 And where did the maker get all those different fabrics? 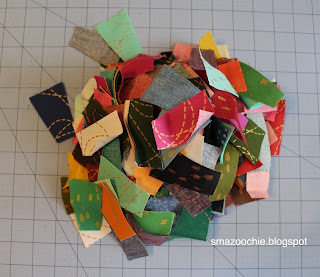 A garment factory that sold scraps, maybe? Anyway, it is keeping its secrets & I am left to wonder & fall in love. 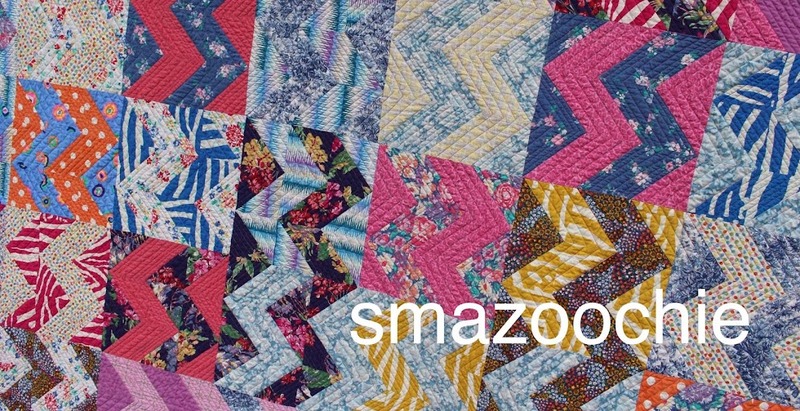 "smazoochie" is a nonsense word that I embroidered around the hem of a pair of jeans when I was about 14 years old. 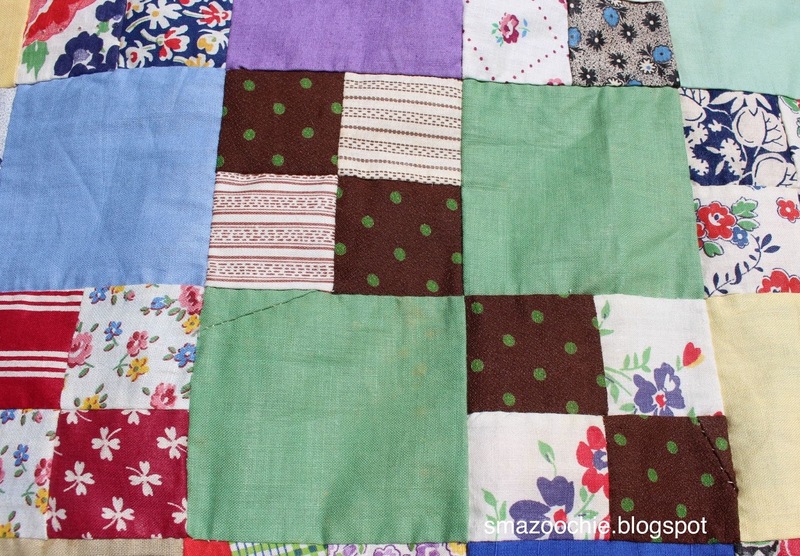 At 14, I had already been sewing and crafting for about half of my life. 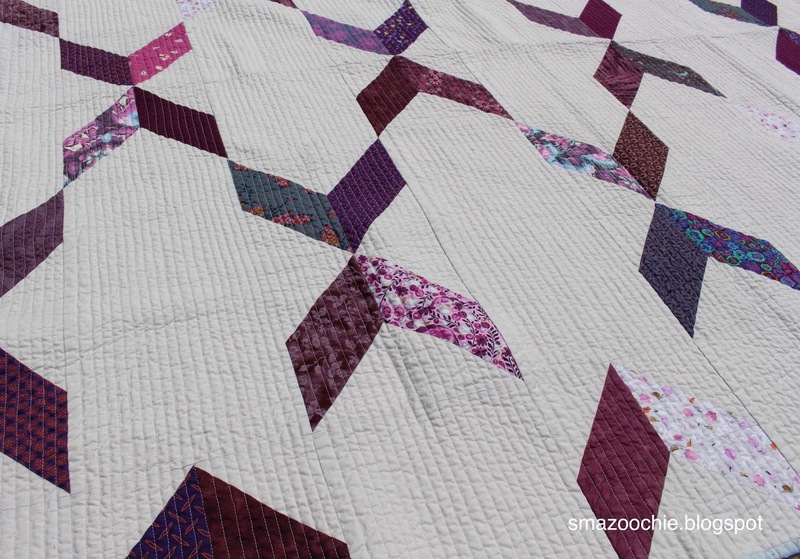 I've tried most of the fabric and string-type crafts, but now my focus is on quilting. 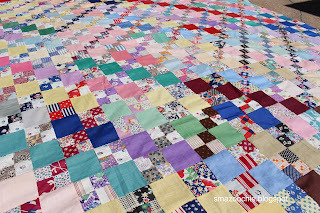 This blog will be about quilts and quilting. Do not expect any praise or reward. Your struggles with the world will have come to an end.